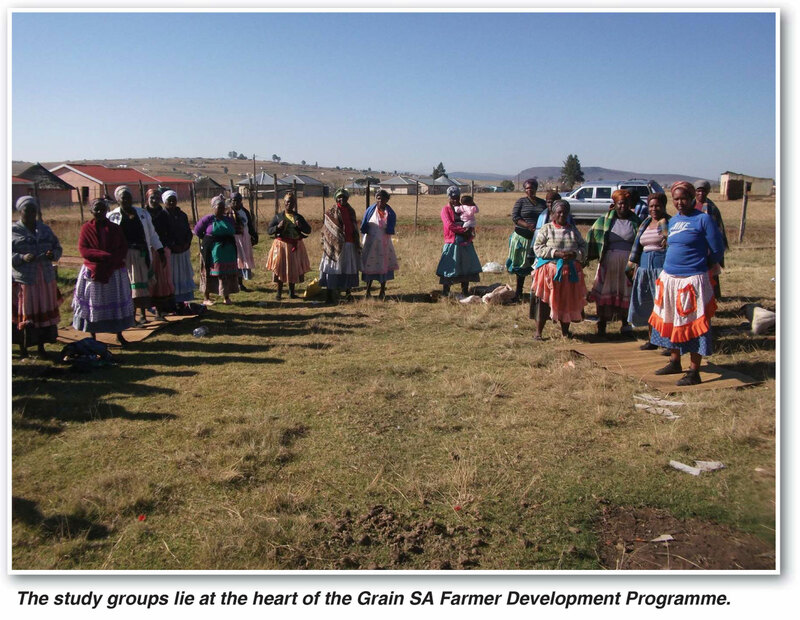 The Grain SA Farmer Development Programme (Grain SA FDP) has become recognised nationally as a flagship for successful farmer development at a time when land reform and transformation has been a national imperative. In the same period there have been countless unimaginable economic and social pressures placed squarely on the shoulders of the agricultural sector not only nationally but globally too. Despite countless challenges and pressures which stretch way beyond the realm of politics and righting past wrongs, the agricultural sector has been asked to play a major role in building a new South Africa. The apolitical grain farmer lobby which is Grain SA, very soon recognised that the agricultural sector needed to be transformed and that it was most important to strive towards a scenario where all grain farmers regardless of race, farm size or capacity have one united voice to represent the sector and address common needs and challenges. A Congress decision was thus made to set up a Farmer Development division within the organisation which would focus on farmer development. This programme has been managed by Jane McPherson since 2005 and has reached deep into the hearts of farmers around the country. Our mission is to capacitate black commercial producers and to contribute to household and national food security through the optimal use of the land and resources available to the farmers. The focus of the FDP team has been to discover meaningful ways to contribute to the dream of a united and prosperous agricultural sector while facilitating healthy and sustainable transformation in the grain growing sector. It is our intention to contribute towards the upliftment of individuals working in agriculture and facilitate improved income generation opportunities for those who have access to land. At all times the team is focussed on the people with whom we work, with the aim of building healthy relationships with developing grain producers. By assisting farmers to use the land they have available, regardless of size, the sector will be able to ignite the rural economy and set the base for other developments. Unemployment rates are high and although the grain sector is not very labour intensive there are nonetheless many employment opportunities which are created in rural areas because of primary agricultural activities. We believe that sustainable development occurs when the individual farmer is equipped to take responsibility for his/her own operations. Farmers should be empowered to farm for themselves as far as possible rather than be farmed for by contractors. Furthermore, where possible, farmers should own their own equipment so as not to have to rely on other service providers. We use a wide range of teaching methods to communicate messages about modern crop production, the importance of accountability and record keeping and the finer nuances of business management principles. Significantly for our purposes the measure of success is the sustainable optimal production of profitable crops on every hectare rather than the total number of hectares planted, or the total number of tons harvested. The FDP has established a significant regional footprint which has made building relationships with farmers and agribusinesses possible. There are nine regional managers servicing farmers, running study groups and mentoring advanced farmers in key grain growing regions of South Africa. Each office in manned by a manager and an administrative assistant. On average, the managers each travel about 4 000 km each month! Another key ingredient of our success is the network of dynamic partnerships we have established. We not only recognise that the extent of our work is directly related to the support of our partners – but we also believe in the value of surrounding each farmer with a wide network of expertise that reaches beyond the FDP team and will continue to support farmers in their districts long after they no longer need development support. It is for this reason that we eagerly embrace partnerships which share our vision and are willing to promote the development of farmers. Talking about partnerships…Grain SA has been fortunate to receive funding from many agencies over the years including the Maize Trust, Winter Cereal Trust, Oil and Protein Seed Development Trust, the Sorghum Trust, the AgriSETA, the ARC, the National Departments of Agriculture, Forestry and Fisheries (DAFF) and the Department of Rural Development and Agrarian Reform (DRDLR) (for the recapitalisation of farmers) and the various Regional DAFF and Rural Development government departments. We can only #MakeADifference with this kind of dedicated support. We have always sincerely appreciated the visionary approach of the Trustees, which has enabled Grain SA Farmer Development to implement a significant and empowering programme that has been to the benefit of the developing grain farmers of South Africa. Contributed to farmer education and skills development. Pursued the optimisation of production per unit area using modern best practices and farming methods. Improved the contribution of emerging farmers to national maize production and consequently has contributed significantly to strengthened food security. Strengthened relationships and support systems between developing farmers and an extended network of sector stakeholders and role-players. The majority of maize farmers in South Africa are not yet producing at a commercial level. Most are subsistence farmers growing grain for family consumption, with possibly a small amount extra for barter or sale. For various reasons they are not yet achieving the yield/ha that they potentially could. Other farmers are growing crops on a larger scale but are also not yet attaining the yields per ha that they should. As much as this is possibly the result of a lack of quality inputs, it can also be attributed to lack of knowledge and skills about appropriate modern production methods and as well as a lack of understanding of business management and marketing skills. Such knowledge and skills have a direct impact not only on yields returned but also on the viability and sustainability of farming enterprises regardless of whether they are subsistence, smallholder or growing commercial operations. 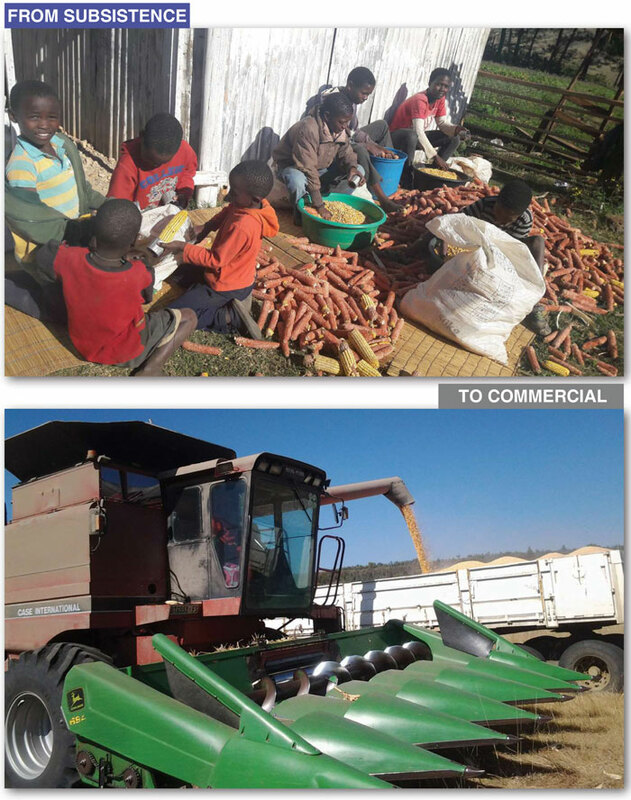 South Africa has many black developing farmers producing maize on wide ranging scales of operations, from subsistence and smallholder farmers to highly intensive commercial farmers. The aim of the Grain SA FDP is to equip individuals, through skills development, training and mentorship interventions, to produce the highest yields possible from every hectare that he/she plants, regardless of the nature of their access to land or the size of their farming operations. It is thrilling to see that irrespective of the size of operation, when farmers know what to do, when to do it, they are empowered to just go out and do the right things by putting their new knowledge into practice, without fail they find that their better informed efforts lead to improved yields. Thanks to the work done by this programme thousands of developing farmers in South Africa are already reaping rewards from doing the right thing at the right time in the right way. The Grain SA FDP for the Western and Southern Cape is managed by Ms Jane McPherson, Manager: Farmer Development and implemented by Ms Liana Stroebel with administrative support from Hailey Ehrenreich out of the Grain SA regional office in Paarl. This development office is responsible for the co-ordination of all study groups and farmers days held in the region and is directly responsible for the transfer of wheat sector specific information and also the identification of up-skilling strategies which may further equip the farmers. The farming development projects in the Western Cape and Southern Cape region continue to service the farmers intensively with skills, networking, crop specific expertise and support to promote wheat production, with the particular goal of supporting these farmers to commercialisation. Grain SA believes that the long-term objectives will be achieved through up-skilling and equipping developing farmers and farm workers in the wheat producing areas through diverse methods of communication and through the dissemination of wheat industry information to the broader developing agricultural sector through the Pula Imvula magazine and by promoting relationships between the farmers and other role-players in the sector. The funding as approved by the Winter Cereal Trust (WCT) for the 2017 financial year excludes all direct support of the operational and personnel costs for administering the Paarl regional office. It also no longer contributes to the funding of the key activities namely the one-on-one farm visits or the broader study group initiatives. This means that WCT funding is exclusively used for: Farmers Days, the Farmer of the Year programme, Training courses and materials and communication through the Pula Imvula magazine. We believe that the crops which the OPDT champions like sunflowers, soybeans, canola and groundnuts play a critical role in the crop production cycles implemented by the farmers we work with, whether they form part of a crop rotation system, contribute to improving soil health or are planted to improve household food security. Many farmers are being forced to consider alternative crops simply because maize prices are under pressure, making maize production a less viable option going forward. We need to ensure that training in production practices and knowledge transfer systems and mentorship are available to the farmers throughout the season. To this end OPOT has contributed to a number of training courses. OPOT funds four pages for the October, January, April and July editions of the Pula Imvula magazine. Articles are written by experienced researchers and agricultural practitioners specifically for the developing farmer agenda. Although translation services come at a price, this is small when one considers the powerful nature of the information and that accessibility of the information to a wider readership is made possible because it is presented in some of our indigenous languages. This year Monsanto has made generous contributions towards the operational costs of our regio­nal offices in Lichtenburg, Louwsburg, Ladybrand, Mthatha, and Kokstad. They also made gene­rous contributions to the trial plots planted in the different regional projects around the country. Monsanto also co-sponsored Farmers Days in the Ladybrand region. These days are well attended and not only do the farmers soak up the information but they also use the occasion to build on their networks with input suppliers and agribusiness representatives. It is a wonderful opportunity to expose farmers to new products and new possibilities. Noteworthy is the fact that the event organised in Fouriesburg was the tenth Farmers Day held on Grain SA Board Member Mr Jaco Breytenbach’s farm in co-operation with Monsanto. Monsanto has also partnered with Grain SA in sponsoring the new Farmer of the Year competition category: Potential Commercial Farmer of the Year which was won by Paul Mvelekweni Malindi from Edenville. Afgri has generously made financial contributions to the operational costs incurred by Louwsburg, Dundee and Ladybrand regional offices. Afgri has also made donations towards a number of the Farmers Days. Afgri has been a willing buyer of small scale farmers’ maize and has participated in Farmers Days where they explain marketing costs, storage costs and pricing structures. During the 2017 financial year Pannar helped towards the operational costs of our Maclear office which primarily mentors subsistence and smallholder farmers. Agricultural potential here is high however land use is sub-optimal and there are vast unutilised tracts of land. Pannar also generously contributes to the planting of trial plots around the country and also supported the launching of Farmers Days. It is particularly important to note that the trial plots are planted with the farmers in mind and therefore the methods the farmers use are the methods used in the preparation, planting and nurturing of the crops. The aim is to show the farmers what they can achieve with what they have at their disposal using best agricultural practices. These are companies which believe that sustainable agricultural development is a priority in this country and have therefore committed to making a difference in the South African agricultural sector by partnering with the Grain SA Farmer Development Programme. DRDLR’s REID programme made cash contributions towards inputs and supplied additional mechanisation. The farmers also all have to make an own contribution which increases each year for four years i.e. 25% - 40% - 60% - 80% and then by year five the farmers will be paying 100% of the costs. It is hoped that this will equip them over the five-year period with skills and expertise to proceed independently and sustainably. In the 2016/2017 season 2 905 farmers participated on 4 317 ha. This project involved regional managers and an additional 26 mentors who supported the farmers. The crops produced by these farmers were very good – many harvested in excess of 5 tons/ha, and some even as many as 9 tons/ha. In the new season there will be in the region of 4 000 farmers on more than 5 000 hectares. The department made a significant contribution to the programme this past year. The sponsorship of the course enabled the presentation of 95 courses about: ‘Mycotoxins – Safe Storage of Maize’. The information is particularly relevant to many of the farmers who store their own grain for human and livestock consumption purposes. The department also donated funds for the purchase of threshing machines for some study groups and they also answered the need for storage capacity by donating ‘Cob Cages’ to the Jobs Fund farmers whose yields have improved so much they did not have enough storage capacity. Santam Agri kindly donated funds towards the printing of manuals for learners who attended the DST course on ‘Mycotoxins – Safe Storage of Maize’ so the farmers have a reference book on this important subject for the future. The Jobs Fund project has demanded detailed data collection and information systems. Santam Agri kindly sponsored the high-tech GPS devices which our Jobs Fund mentors have used for this purpose. They also contributed towards the purchase of threshing machines which was an urgent need that has arisen out of improved production practises and better yields than many of the Jobs Fund farmers have seen before. The project is managed by Johan Kriel out of the Ladybrand Regional Office and focuses on capacity development i.e. education and skills development as well as with infrastructure development and operational inputs. This is intended to uplift farms which were acquired through the land reform and redistribution policies of the national government. Grain SA has been fortunate to access recapitalisation funding for 17 farmers in the programme during this financial year. The study group lies at the heart of the Grain SA FDP. This is where we meet the farmers, get to know their circumstances and challenges and build relationships of trust; and where we can do the strongest networking with them. Through consistently pitching up and being present with an attentive ear, a word of advice and sharing our passion for using what they have at their disposal as effectively and sustainably as possible, the farmers have learned that the team can be trusted to help. The meetings are dynamic and varied and are conducted indoors, where DVD and PowerPoint displays inspire them, and outdoors, where our development officers and mentors get down and dirty in the fields demonstrating, fixing, and teaching in very practical hands on fashion. It is in this way that the farmers have learned that we care and can be counted on! South Africa has some of the most advanced commercial farmers in the world. There is a wide gap between them and Grain SA’s New Era farmers who are producing 250 tons of maize from their land and are farming each hectare to produce the highest possible yield on a semi-commercial scale. To provide one year of intensive one-on-one support to outstanding candidates who have come out of the Study Group system in terms of production planning, management, making financial applications and reporting etc. After the year has been completed, they should be able to manage as commercial farmers with occasional telephonic advice from their mentors. Each year a new group of farmers is identified and supported in this manner. When a farmer is farming each hectare to commercial standards of yield and is producing more than 250 tons a year, he/she will be fast tracked into the commercial sector and will be ‘handed over’ to the commercial growers in that area. This process contributes rapidly to the growth in numbers of black commercial farmers. The significant role played by print media lies in its ability to deliver timeous and relevant information quickly and efficiently. The magazine is invaluable for creating awareness about new ideas and practices and for transferring ideas about business management, planning and budgeting. Unlike radio and TV which are undeniably also effective tools for knowledge transfer, a magazine in the hand can be referred to time and again or shared and passed on to other farmers. Within the Grain SA FDP the magazine has become a tool used by the development officers and mentors. The content in the magazines is often discussed further in the study group meetings so it becomes a teaching tool. Also, the farmers often come to the study group with the magazine in hand to ask a question about an article he or she has read. The ensuing discussions become a teaching opportunity for all those present. The magazine is audience oriented and presents short messages with pictures to enhance meaning. 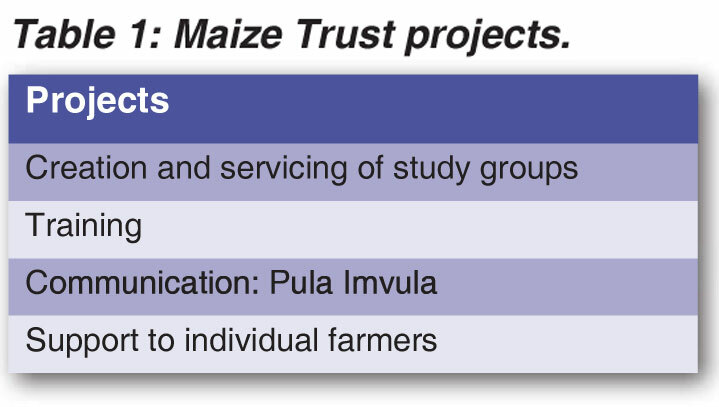 The Maize Trust: Monthly – eight pages. 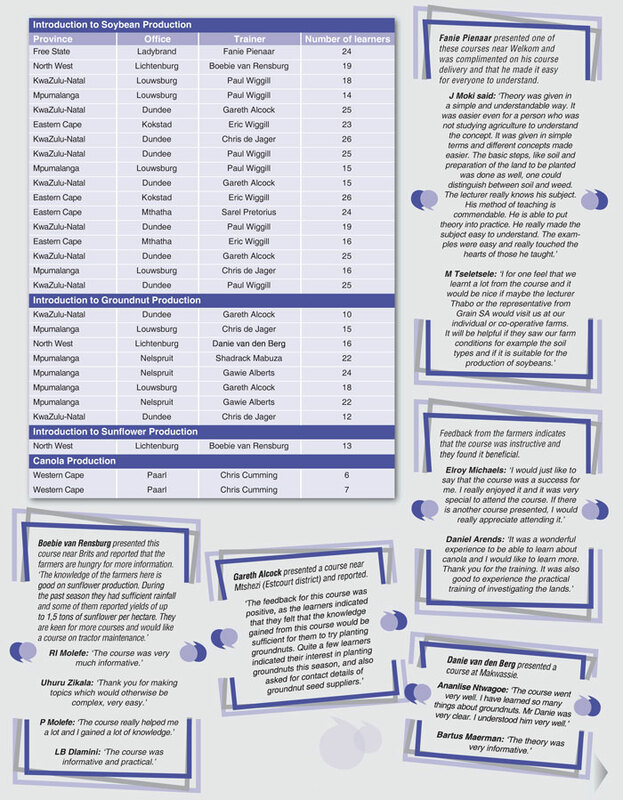 The Oil and Protein Seed Development Trust: Quarterly – four pages. The Winter Cereal Trust: Quarterly – four pages. Commercial sponsorships: English expanded version: Monthly – eight pages. A wide range of courses are offered for free by the Grain SA FDP team. This is possible thanks to generous funding from the trusts AgriSETA, the Maize Trust, the Winter Cereal Trust and the Oil Seed Trusts and other stakeholders. 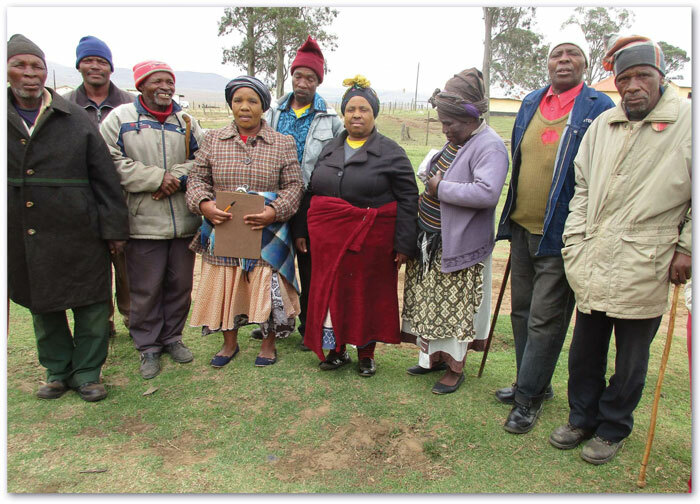 The training program is co-ordinated by Dr Willie Kotzé who together with the regional managers identifies appropriate courses for the farmers in a particular study group. Our training courses are structured to address theory and practical application on a wide range of topics which have been structured into week long courses which are sponsored by a number of invested partners. The training is delivered in the language of the farmers and is designed to make immediate impact to their farming business, workshop management knowledge and plant production capabilities. The regular feedback from the farmers consistently reassures us that we are equipping and empowering them in a meaningful way. During 2017 we launched our own FDP Twitter account: Grain SA Farmer Dev. Our handle is: @gsafarmerdev. The pinned tweet headlines our newsfeed with a short explanatory video about our programme. If you are interested in following the progress of our team, you are welcome to log in to our Twitter account which highlights weekly grain farming and development activities around the country. We would love to see more of you on that platform and share our up to the minute news with you there!